FedEx donates disaster response vehicle to The Salvation Army. The Salvation Army in Colorado has another tool to assist those in need during times of disaster, thanks to a $114,000 disaster response vehicle customized and donated from FedEx through the company’s FedEx Cares program. A celebration and dedication of the new vehicle took place April 12 at the FedEx facility at 350 Spectrum Loop in Colorado Springs, Colorado. 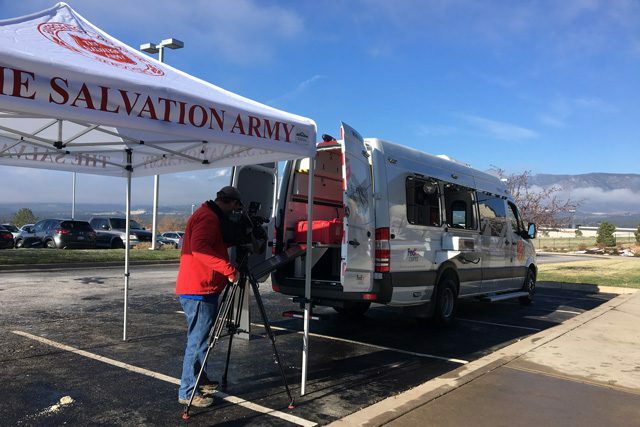 The new vehicle is more than just a sleek version of The Salvation Army’s current disaster response fleet; it’s also more maneuverable and cost effective to operate and maintain. The vehicle’s smaller size and four-wheel drive capabilities allow emergency response in areas unreachable with the large mobile feeding units or during severe winter weather—such as last month’s bomb cyclone—or in treacherous mountain terrain. With the utilization of modern materials and manufacturing, the vehicle is expected to withstand the stresses of disaster response better than older models, while still providing ample room for supplies, and the ability to go from day-to-day local emergency support to hauling supplies for a large-scale response. The unit is outfitted with a portable generator interface, tents, mobile charging stations, a commercial microwave, coffee makers and hand washing stations. “With the addition of the new disaster response unit, we will be better prepared to serve than ever before,” Intermountain Divisional Commander Major Mike Dickinson said. This is the 22nd vehicle FedEx has donated to The Salvation Army for disaster response throughout the United States, the United Kingdom, Mexico, Canada, Puerto Rico, and Australia. However, this is the first vehicle of its kind to be added to The Salvation Army’s local disaster fleet. FedEx has a long history of supporting disaster relief and recovery efforts including assisting with The Salvation Army’s relief efforts following last year’s wildfires. Following the dedication, FedEx team members volunteered with The Salvation Army to serve lunch and dinner to people experiencing homelessness at Dorchester Park.